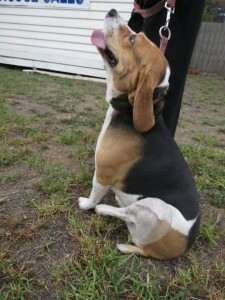 Nicki's Story | East Bentleigh Animal Care. 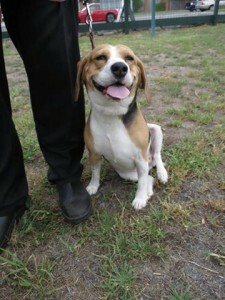 Nicki is a 3.5 year old Beagle. Worried owners Trevor and Trish brought Nicki in to the clinic as she had been limping on her left hind leg for a few days and it had gotten worse. Nicki showed signs of pain at the left knee joint when examined. Dr Singh suspected cruciate ligament rupture so she was quickly booked in for x-rays and exmination under general anaesthetic. The examination and x-ray revealed rupture of the cranial cruciate ligament. Just like with a human cranial cruciate rupture can be caused by trauma (like an athlete) or degenerative joint disease (with older age). Surgery was performed in early February and Nicki is recovering and doing well. Obesity can increase the impact on the joint and can predispose to the damage of joint and ligament. Without corrective surgery, knee problems in dogs can develop into very painful degenerative wear on the menisci of the knee and arthritis.